Today’s recipe is “Chocolate–Peanut Butter Shortbread Bars”, from Lora Brody’s Chocolate American Style (Clarkson Potter, 2004; p. 196). Even though this was one of my “easy midweek” recipes, I took enough pictures to do a full walkthrough; if you notice that these pictures look a little darker and grainier than my photos usually do, it’s because the batteries in my flash died, so I’m stuck with the dim “natural” light in my kitchen, and have to push the camera sensitivity up way high just to get a usable picture at all in those conditions. 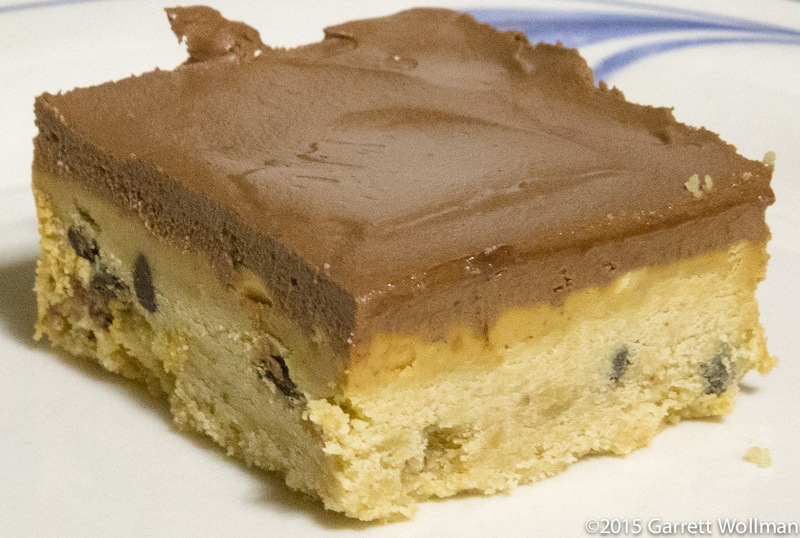 In any event, this dessert consists of a peanut-butter-and-chocolate-chip shortbread, topped with a layer of pure peanut butter and then a chocolate-flavored sour cream faux-buttercream frosting. Most tasters enjoyed this dish greatly, but a few had issues with the texture of the shortbread or felt it was too rich, and some other tasters noted the lack of distinct chocolate flavor from either the mini-chips baked into the shortbread or the frosting. 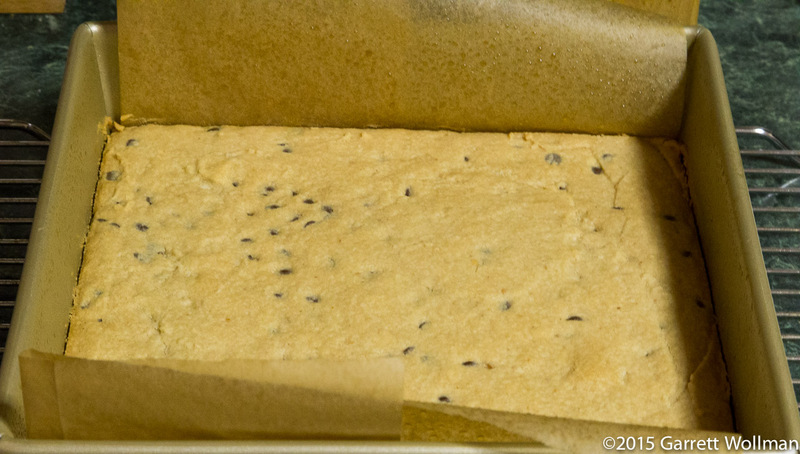 Overall response was very positive, but if I were to make this again, I’d skip both topping layers and use larger, stronger-flavored chocolate chips in the shortbread proper. 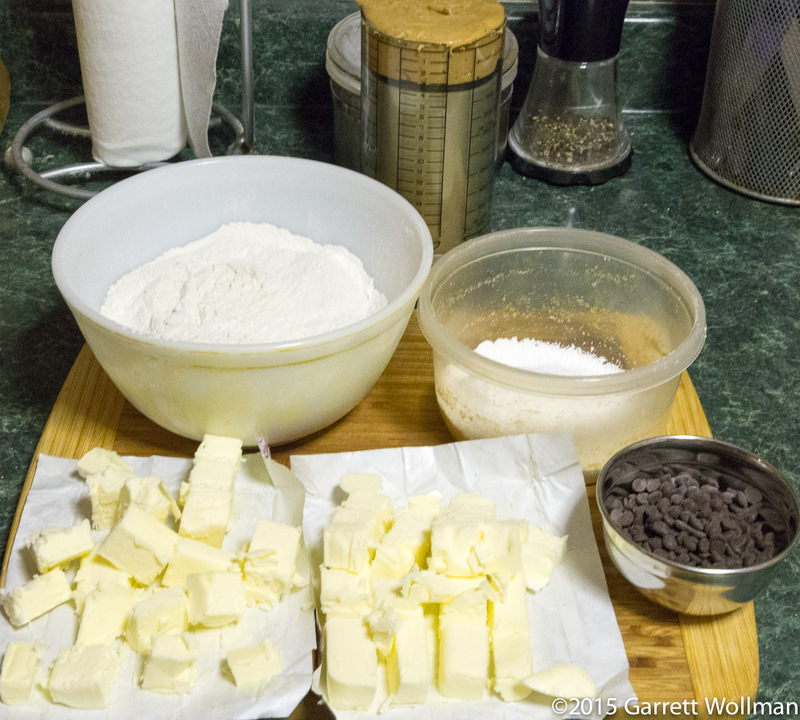 The dough couldn’t be simpler to prepare: just dump all the ingredients — except the chocolate chips — into the food processor, and let it rip until it forms a ball. Then turn it out onto a work surface and knead the chips into the dough. 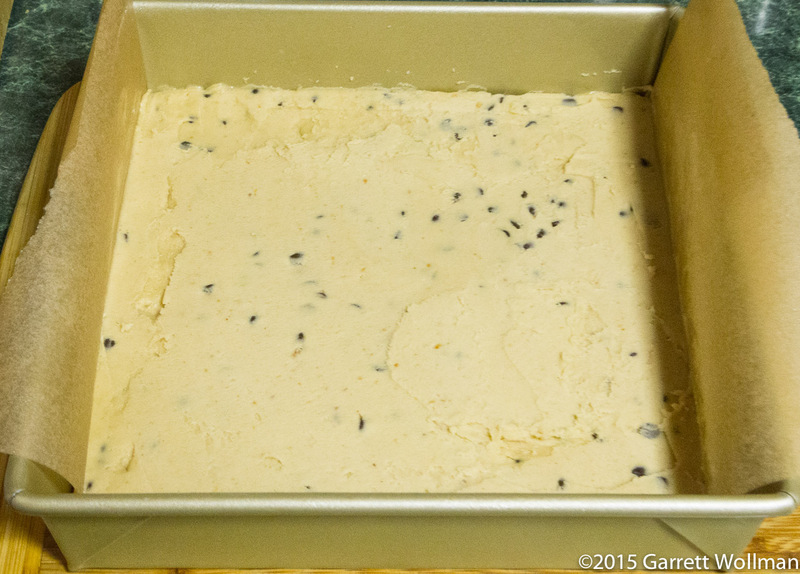 As you might expect, the dough is pretty stiff, and has to be pressed into the pan. I used the standard parchment sling with baking spray rather than old-fashioned butter and flour for this — particularly since Brody recommends using a glass pan (which I don’t have) to avoid damaging the coating on a normal metal one. This is a 9×9-inch (24 cm) pan; Brody suggests an 11×7″ pan as an alternative. 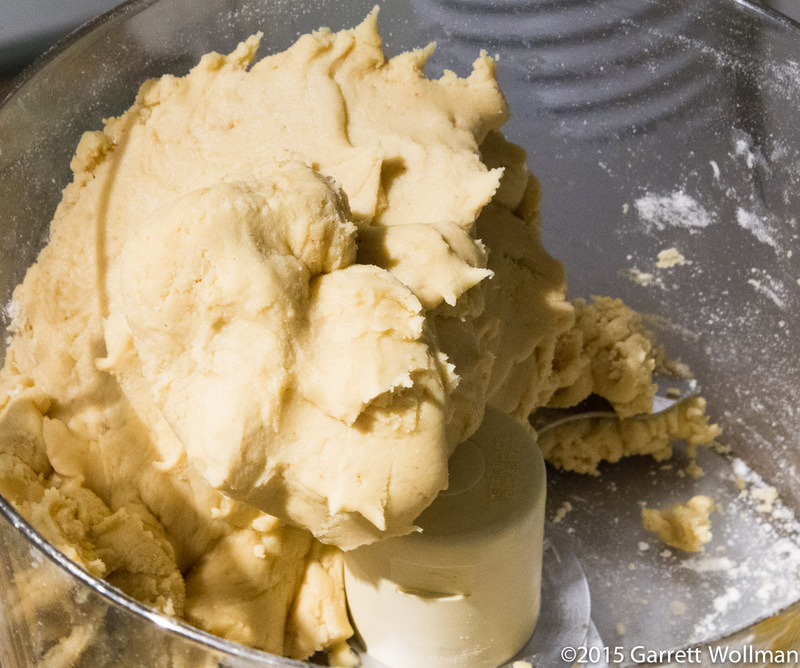 The shortbread takes about half an hour in a 350°F (175°C) oven, after which it cools in the pan for ten minutes before applying the peanut-butter layer. The peanut-butter layer is nothing more than another cup (260 g) of peanut butter, melted over low heat on the stovetop, and then spread over the warm shortbread. The pan is then cooled in the refrigerator to set the peanut butter — I suppose you could do it at room temperature, but it might take a while. 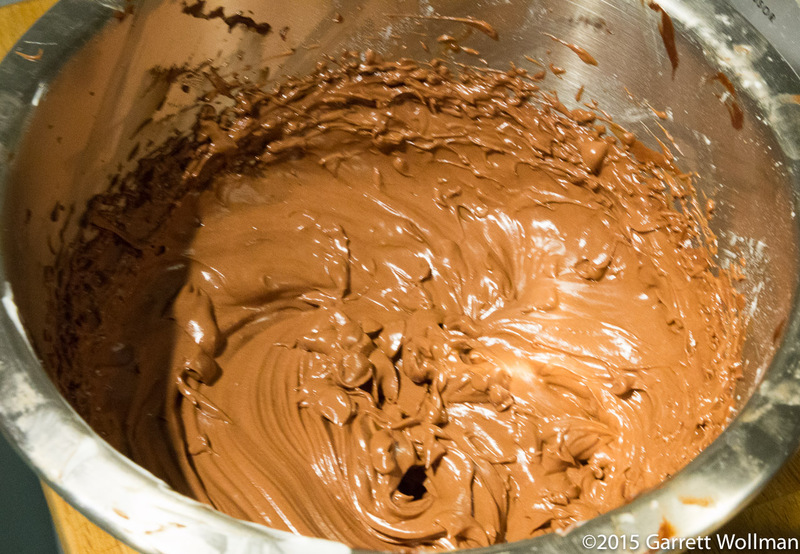 Meanwhile, the chocolate frosting can be prepared. Starting with the mise en place again, we have 3 oz (85 g) of sour cream, 1½ oz (40 g) of room-temperature butter, another 2 oz (55 g) of powdered sugar, and 3 oz (85 g) of bittersweet chocolate wafers. For the chocolate this time, I chose the Guittard 74% organic wafers, which I appear to have found at Whole Foods; knowing that the chocolate would be diluted with twice its weight in dairy, I chose the strongest chocolate I could reasonably use. (If this recipe had called for something more like a glaze or ganache, I would probably have used a 66% chocolate instead.) The chocolate is melted in the microwave and allowed to cool slightly before proceeding to make the frosting. 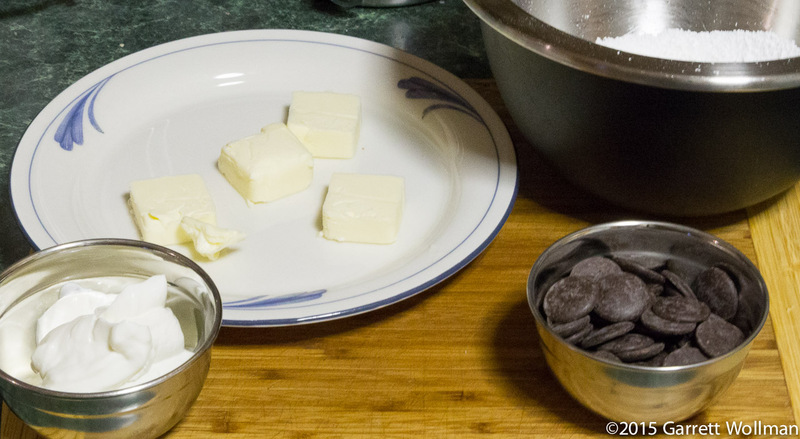 Using the hand mixer and a small bowl, the sour cream and softened butter are beaten together before mixing in first the melted chocolate, and then the powdered sugar, to form a silky smooth frosting. 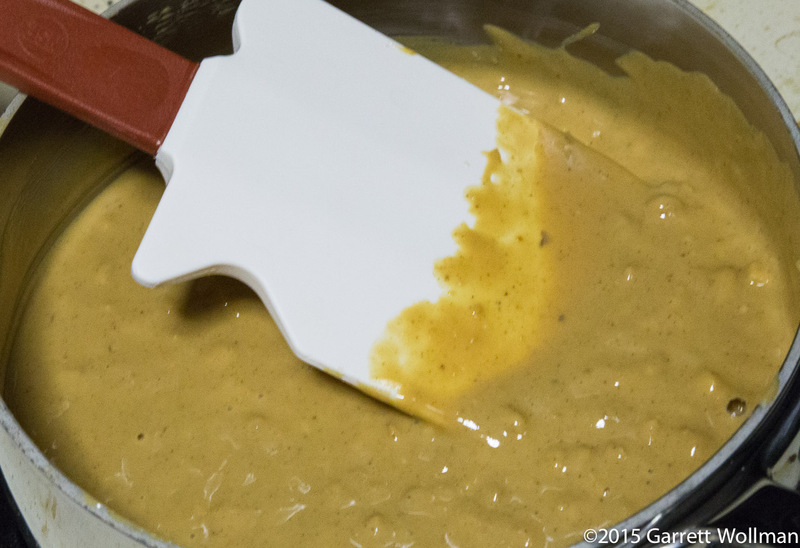 The frosting is simply spread with a spatula over the top of the peanut butter. Although Brody doesn’t recommend this, I put the pan of frosted shortbread into the fridge overnight to ensure that the frosting would set up (as much as it was going to, anyway) and took it out the next morning to portion into sixteen 2¼” squares using a chef’s knife warmed in hot water and then dried with a paper towel. Just for you, I dirtied a dessert plate to photograph a single serving. These bars are killer. Seriously — they’re shortbread. That means “full of saturated fat”. (The “short” in “shortbread” is the same as the “short” in “shortening”!) But in the interests of consistency, if nothing else, I’ll give you the nutrition details anyway. Just don’t tell your cardiologist. 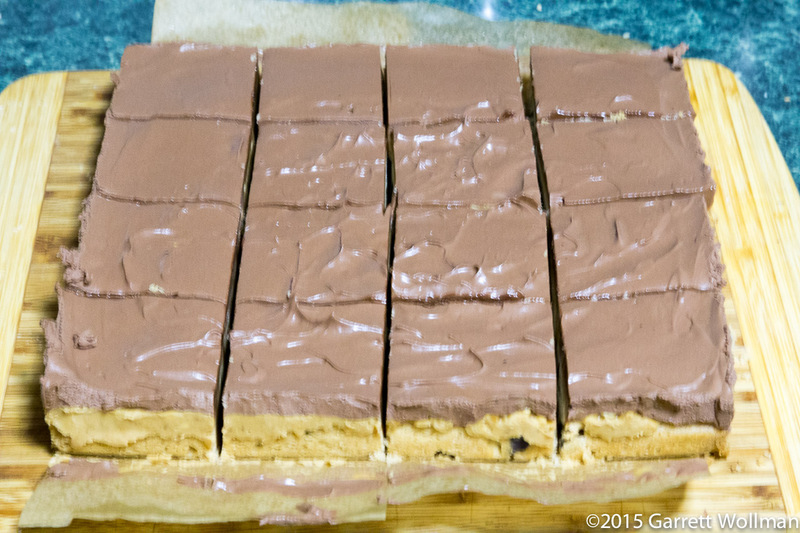 Gallery | This entry was posted in Food and tagged chocolate, Lora Brody, peanut butter, recipe, shortbread. Bookmark the permalink.